We’ve been debating what what ‘doing the right thing’ means, and now we’re talking about what this means to HR professionals. Katerina Rudiger is talking about how the CIPD has 146,000 members and there is significant potential for CIPD members to do a lot of good in the world. 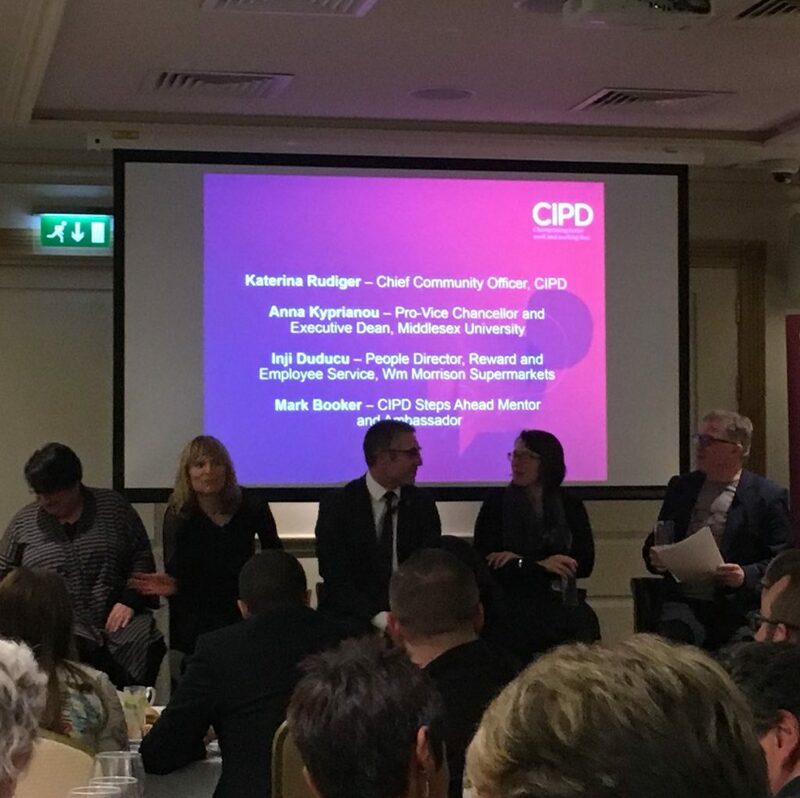 We’ve already heard some good examples from the panel; about Mark’s experiences as a Steps Ahead Mentor & Ambassador, and also Anna in terms of serving on the CIPD Board. As citizens, we have rights, we have privileges, but we also have responsibilities and the idea of professional citizenship is that HR professionals have a responsibility to use our skills to do good. The panel aren’t in complete agreement on this, with Inji saying that HR professionals shouldn’t be mandated to give extra time as they won’t always be in a position to do this and shouldn’t be judged for that. Anna, though, is of the opinion that there must be a clear call to action but it should be personal and it could make a huge difference if we could encourage 140,000 people to use their professional skills to do good. There’s also a push back from audience members, saying that this shouldn’t be mandated. There’s also challenge from an audience member encouraging CIPD to help their members focus on some other issues in their employing organisations (e.g. paying the living wage, what do we do about zero-hours contracts?). There’s a range of views in the audience about topics, and a discussion about the merits of volunteering as part of job-hunting and career development. Lots of interesting discussions, and there does seem to be an opportunity (that will show up in different ways for different people) to use their skills for good in order to champion better work and working lives. My personal view is that the opportunity is huge; if we use our professional skills to do good then not only do we make the world a better place, but we also develop and hone our own skills by applying them in different contexts. I’m sure the debate will continue about how we can encourage people to see the possibilities and do what works for society, for their employer, and for them.